LAKE PLACID — It’s that much-anticipated time of year again in the hockey-rich village of Lake Placid. On Friday and Saturday, the Olympic Center hosts the ECAC Men’s Ice Hockey Championships for the sixth year in a row. The games are being played at the 1980 Herb Brooks Arena, and the field features Brown, Clarkson, Cornell and Harvard. 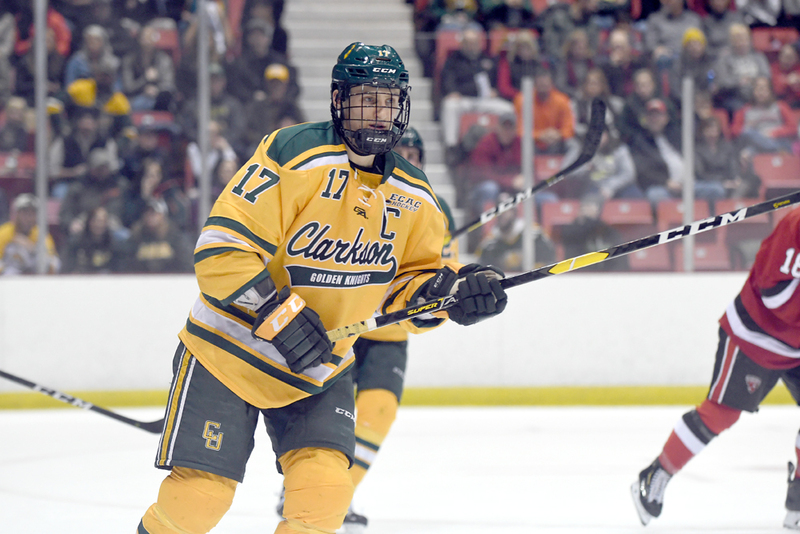 Clarkson, Cornell and Harvard all advanced to Lake Placid a season ago and return looking to claim the ECAC championship trophy, the Whitelaw Cup, that eluded them in 2018. Brown is the new team in the mix after reaching the semifinal round for the first time since 2013. The two semifinal matchups take place Friday at 4 p.m. and 7:30 p.m., with the championship game slated for 7 p.m. on Saturday. The Golden Knights, Big Red and Crimson head to Lake Placid ranked 12th or better in the Division I national polls, while the Bears enter the tournament as the lowest seed at No. 8. Clarkson and Harvard square off in Friday’s second game in a rematch of last year’s semifinal that saw the Golden Knights rally from a 3-0 deficit to claim a 5-4 victory against the Crimson in overtime. Cornell and Brown will battle it out in the opening game of the doubleheader starting at 4 p.m. Although the 15-13-5 Bears may not have had the regular-season success they wanted, they certainly earned the trip to Lake Placid by sweeping their first two playoff series in amazing fashion. Brown opened the postseason at home by dethroning last year’s champion, Princeton, clinching that series with a 6-5 triple overtime victory. The Bears then hit the road to topple the ECAC’s regular-season winner and top seed, Quinnipiac. They won the first game 2-1 in overtime and then came up big late in the second contest, climbing out of a 2-0 hole by scoring four times in the third period to triumph 4-3. Despite being just two wins above the .500 mark, Brown has really come around, compiling a 12-6-2 record since the start of the new year. “We’ve played great hockey for the past three months,” said Brown head coach Brendan Whittet, who is in his 10th season leading the Bears from behind the bench. “Our road to Lake Placid was as difficult as it gets. We had to knock off defending champ Princeton, who had three players sign NHL contracts after the series, and then we swept the top-seed Quinnipiac on the road. After defeating last year’s champ and following that with a triumph over the top seed, Brown has another tough task ahead in facing Cornell, which is the highest remaining seed at No. 2. The Big Red finished runner-up to the Bobcats during the regular season with a 13-5-4 mark and own a 19-9-3 record overall. Senior forward Tommy Marchin leads Brown in scoring with 11 goals, 15 assists and 26 points, which is tied for 18th on the ECAC stat sheet. Junior defenseman Zach Gluttari is second for the Bears with seven goals and 13 assists. Gavin Nieto is Brown’s top goaltender, starting in 17 games. The junior from Yorba Linda, California, owns an 11-5-1 record and a per-game goals-against average of 2.25. Cornell entered last year’s championships after claiming the ECAC regular-season crown, and its run to Lake Placid ended quickly with a 4-1 upset loss to Princeton in the semifinals. The Big Red did receive an at-large bid to the NCAA tournament but was eliminated in a 3-1 first-round setback to Boston University. Cornell has enjoyed another solid run this winter, and longtime head coach Mike Schafer said it’s been a long process returning to Lake Placid. He’s hoping that things turn out better than they did in 2018. “We had a good season last year but didn’t win on Friday night,” said Schafer, who is in his 23rd year behind the bench at Cornell. “I think the guys are excited to come back for another shot. It’s tough to get back here. When you have a good season, the pressure really comes on at playoff time. Morgan Barron, a sophomore from Nova Scotia and a New York Rangers draft pick, leads Cornell in scoring with 13 goals and 19 assists. Mitch Vanderlaan is second on the team with 10 goals, 18 assists and 28 points. Matthew Galajda, a sophomore from Aurora, Ontario, anchors the Big Red defense in nets and has compiled a 10-4-3 record and a 1.95 goals-against average. Record-wise, Clarkson and Harvard head into battle after having nearly the same success in the regular season, as both teams posted 13-7-2 marks in ECAC play. They each claimed 2-0 quarterfinal series sweeps at home a week ago, with Clarkson knocking off Yale and Harvard eliminating Dartmouth. Harvard is looking to win the Whitelaw Cup for the third time since the ECAC championships returned to Lake Placid in 2014, and the Crimson carry a 19-9-3 overall record into the semifinal round. The Crimson boast the NCAA Division I top scorer in junior defenseman Adam Fox, who leads the nation with a 1.48 points-per game average. The Jericho, New York, native and 2016 Calgary Flames draft pick has nine goals and an NCAA Division I best 37 assists. Sophomore Reilly Walsh is next in scoring with 12 goals and 19 assists, and freshman Casey Dornbach has chipped in seven goals, 22 assists and 29 points. Until a month ago, Harvard’s defensive effort was led by goaltender Michael Lackey, who appeared in 24 games since the start of the season. But an injury sidelined the senior from Washington, D.C., which has provided Cameron Gornet a chance to step up, and the junior from St. Louis, Missouri, has come through, posting a 5-3 mark in the last eight games for the Crimson. 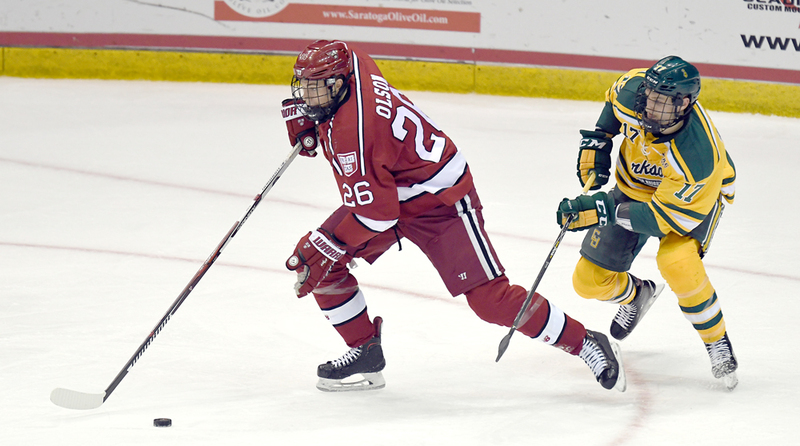 Donato said Harvard will be taking on a high-scoring Clarkson squad that also is strong in its defensive end of the ice. The Golden Knights are ranked ninth in three national polls and bring their 24-10-2 record to the Olympic Center. A year ago, they reached the ECAC final and lost 2-1 in an overtime heartbreaker to Princeton. Clarkson’s first forward line has combined for 102 points this season with 36 goals and 66 assists. Two of those players, Nico Sturm and Haralds Egle, rank third and sixth in the ECAC points standings. They also have one of the nation’s top goaltenders in Jake Kielly. The junior from Eden Prairie, Minnesota, has started in all 36 Clarkson games this season and has 24 victories and a 1.90 goals-against average. Win or lose, coaches bringing their teams to Lake Placid say their players and fans are in store for a special weekend of hockey. Brown has never won the ECAC postseason title since the league was established in 1962 and has made just four appearances in the championship final. Coach Whittet was on one of those Brown Bears teams that played in a championship game, which was a 3-1 loss to Clarkson that took place in Lake Placid in 1993. The 1994 Brown University graduate said he’s happy for his team and hopes they will be able to add that one achievement to their playing days that escaped him: winning the Whitelaw Cup.